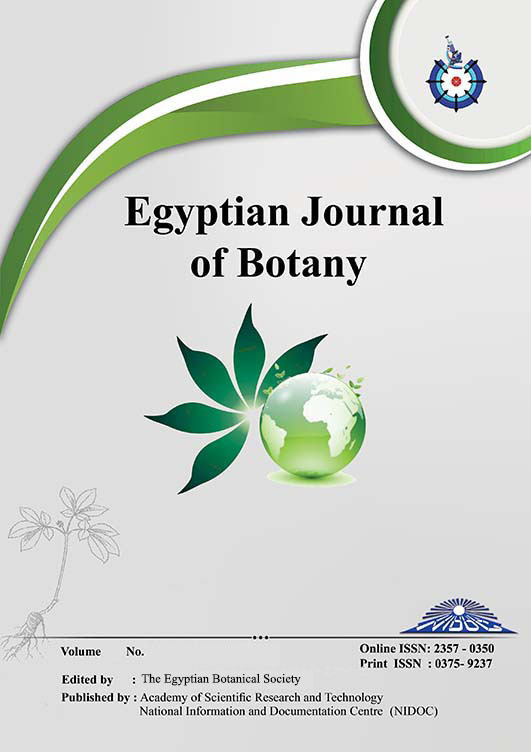 TWELVE stands of Aerva javanica shrubs were visited during the winter and summer seasons of 2015 in two tributaries of WadiQena (Wadi El-Atrash and Wadi El-Ghuza) in the Egyptian Eastern Desert. Soil analysis showed low contents of soil moisture (SMC) and organic matter and slight alkalinity. Chlorophyll contents (Chl. a & b) and their ratio increased significantly during summer season, while their stability index increased during winter. The contents of Ca and K were high during summer, while PO4 and Na were higher during winter. Soluble sugars and soluble proteins increased during summer while total free amino acids were higher during winter. It can be concluded that there are close relationships between the high K, Ca and Cl contents and the hot-dry conditions prevailed in the summer season, and the accumulation of soluble sugars (SS) and soluble proteins (SP) on the relatively humid-cold season. Statistical correlations showed important positive relations between soil Na and plant water content (PWC), chlorophyll parameters, SS and SP. Fortunately, there was negative relation between soil PO4 and the contents of Na and Cl in the shoots. Spatial variations were the most important factor that controls A. javanica PWC, Na, K, Ca, Cl, PO4, Chl. a and b, SS and SP. While, Mg, chlorophyll a stability index (CSI a), CSI b and total amino acids (TFAA)were affected by the variation in both spatial and temporal gradients.